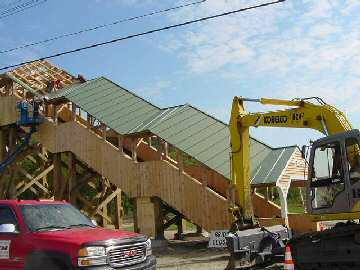 September 5, 2003 -Here is an update on the Brighton, VT Covered Pedestrian Bridge . 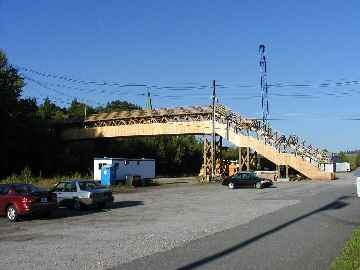 . .
After many years of hard work by the Town of Brighton and support from the Vermont Agency of Transportation, the Brighton Pedestrian bridge is nearing completion. 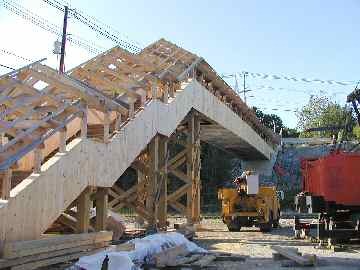 The bridge consists of three sets of elevated wooden stairs on timber piers, a 112 foot long Howe truss main span and covered stairs on grade. The total length of the covered portion of the bridge and approaches is 327 feet. 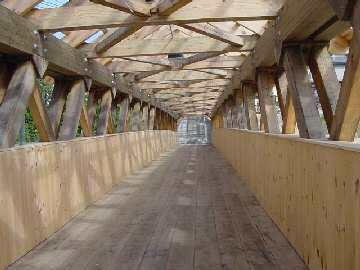 Design of the bridge and construction inspection are being completed by Hoyle, Tanner & Associates. The grand opening is scheduled for the end of September. We will forward the date and time once it has been finalized.